The second volume of the BFI's DVD releases of films screened in the BBC's annual Ghost Stories for Christmas strand, in common with the simultaneously released Volume 1, contains two films based on stories by author M.R. James. 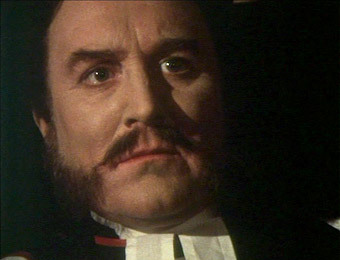 Whereas volume 1 contained two adaptations of the same story – Oh, Whistle, and I'll Come to You, My Lad – the films on volume 2 are adaptations of two different stories, The Stalls of Barchester Cathedral and A Warning to the Curious, both of which were adapted, produced and directed by series regular Lawrence Gordon Clark. The Stalls of Barchester was the first official entry in the Ghost Stories for Christmas strand and was adapted from James' story The Stalls of Barchester Cathedral, which was first published as part of the More Ghost Stories collection in 1911. It takes its time to establish its ghost story credentials and is not quite as creepy as it might have been, but it's still an elegantly executed work with a sprinkling of effectively unsettling sequences, and very effectively sets the style for BBC Christmas ghost stories to come. Dr. Black (Clive Swift) has the job of cataloguing the library at Barchester Cathedral, a task he quickly tires of due to the dullness of the material he is required to read. It's then that the librarian remembers a chest that was bequeathed to the Cathedral sixty years earlier. 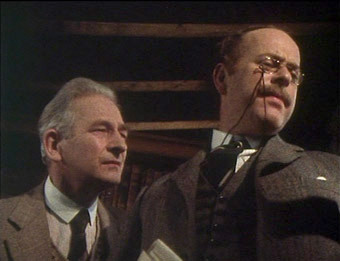 Inside they discover the diary of one Dr. Haynes (Robert Hardy) that outlines his arrival in Barchester and his eventual ascension to the position of Archdeacon after his predecessor, the elderly Archdeacon Pulteney (Harold Bennett), takes a fatal fall down the stairs of his house. Although never openly admitted, the diary suggests that Pulteney's death was the result of foul play on the ambitious Haynes' part, but following his ordination, Haynes is plagued by strange sounds and unsettling visions. Unfolding as a dual timeline, with Haynes' diaries dramatized in flashback, the film is over a third of the way in before the first signs of supernatural activity start to appear. Patience is thus required, but compensation aplenty is provided by Haynes' growing frustration at Pulteney's stubborn longevity, which is wonderfully conveyed through smart use of shot repetition and Hardy's gradual transformation from cordial politeness to eye-rolling frustration. It's when Haynes starts hearing noises and having unusual visions that the consistency falters a little, although much of the blame for this can be laid at the feet of changing times and the repeated use of some elements in subsequent genre films. The black cat that scratches and cries in the night is the key offender here, having been recycled since by any number of giallo and Poe-influenced films, while the voices that Haynes hears by night would probably have been more unsettling if they didn't consist solely of dialogue from early scenes, making them play more like memories than hauntings. But elsewhere a very real sense of unease is created through the simplest of techniques: the scuttling sound that suggests a large and active rodent; the focus on Haynes' worried and candlelit face as makes his way downstairs at night; the footsteps that echo and stalk him through the cathedral halls. The seat-jumping favourite of having a character check behind them and then get a start when they turn back to move forwards is given an early outing here, and there's a splendidly executed frisson where Haynes has is back to the camera and... no, I'm not about to spoil that one. Haynes' inevitable demise lacks the drama and shock value it may once have had, and the wooden carving that transforms into a hooded skull is an image that now feels creakily old-hat. But there's still something oddly disconcerting about the idea of furniture carved out of wood from something known as The Hanging Tree by a man known as Austin the Twice-Born. for us, as well as a far more actual one attending us. and we could not either of us look at his face. Even by the standards of M.R. James, A Warning to the Curious is a belter of a title for a cautionary ghost story, a subtle suggestion of the potentially dire consequences of sticking your nose in where it doesn't belong. In this particular case the warning is a little misleading, as it's the theft of an ancient relic rather than curiosity about it that stands to be punished. Allow me to elaborate. In the region surrounding the East Anglian coastal town of Seaburg, legend has it that three Anglo Saxon crowns were once buried to protect England from invasion. The first was plundered by thieves, the second lost to the sea, but the third remains hidden somewhere beneath local turf. For five generations a local family have dedicated their lives to protecting it, but the last of the line, William Ager, died some years before without leaving an heir. Having read of the legend, middle-aged amateur archaeologist Paxton arrives in Seaburg with the intention of locating and retrieving the crown, unaware that the spirit of William Ager continues to guard it from beyond the grave. Surprisingly, perhaps, given writer-director Lawrence Gordon Clarke's fondness for the writings of M.R. James, the film version of A Warning to the Curious makes some significant changes to the original text, particularly in the character and intentions of Paxton. In the book he is a young innocent who stumbles across the legend by chance while making architectural studies of local churches, whereas in the film he is an older, more secretive man who arrives in Seaburg with the very specific intention of locating and retrieving the crown. The film also abandons James' layered approach to storytelling in favour of a more linear approach, but unlike the changes made to its source story by the 2010 take on Whistle and I'll Come to You, these alterations in no way detract from or dilute what made the story work so well in the first place. The only addition that has been rendered a tad over-familiar by time is a new opening sequence in which an archaeologist is beaten to death while in the process of digging up the protected crown, the sort of preview of the threat to come that, while relatively fresh back in 1972, has since become a staple component of modern film horror. But this is a small gripe when everything else works as well as it does here. Scholars have drawn parallels between the plots of A Warning to the Curious and Oh, Whistle, and I'll Come to You, My Lad, both of which involve the unearthing of an ancient object by an outsider to the region who then finds himself being stalked by a potentially hostile entity. It's a bond cemented by the film adaptations, all three of which (if that looks like a typo, remember there were two of Whistle) have aged their young protagonists by at least thirty years and cast respected and experienced older actors in the roles, each of whom have brought more depth to their characters than they had on the page. 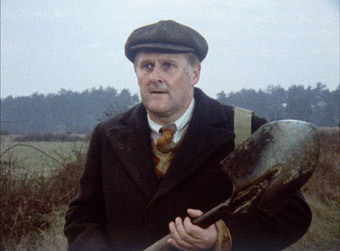 Here the excellent Peter Vaughan invests Paxton with a level of driven determination that, combined with the 30s depression-era setting, his recent redundancy and his disdain for academically trained archaeologists, provides a solid and socially relevant motivation for his actions. As with Professor Parkins in Jonathan Miller's 1968 version of Whistle and I'll Come to You, there's a tangible sense that once Paxton possesses the object that he has been seeking, he is never subsequently alone. The difference here lies in the screen time devoted for the retrieval of the catalytical artefact. 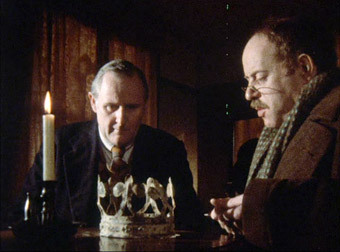 In Whistle its discovery is handled quickly and without drama, whereas here the unearthing of the crown is the film's longest scene, one whose building sense of foreboding and use of facial close-ups, coupled with the conviction of Peter Vaughan's mounting fear of what waits just beyond the reach of his lantern, is genuinely unnerving. Here Paxton is at least able to share his fears with a sympathetic third party, none other than Dr. Black from The Stalls of Barchester (again played by Clive Switch), whose relaxing holiday is severely disrupted when he becomes inadvertently caught up in Paxton's predicament. The ghost of William Ager does prove to be an inconsistent stalker, alternately watching, walking alongside and aggressively chasing Paxton, a solid apparition one minute and invisible the next. This disconcerting unpredictability gives rise to two of the film's most eerily effective scenes. The first occurs when a train guard opens the door to Paxton's compartment for a boarding passenger, only to then realise there is no-one there after all, which is later revisited to provide a splendidly foreboding ending. The second takes place in Paxton's room the following evening when the room is plunged into darkness and the subsequent torchlight reveals the hunched figure of Ager, who slowly begins to rise to look back at Paxton before being once again plunged into blackness, as frightening a sequence as I've seen in a made-for-TV ghost story. A Warning to the Curious showcases the BBC's Ghost Stories for Christmas slot at the top of its game. An overuse of a signature high-pitched electronic crescendo from avant-garde composer Gyorgi Ligerti's Atmospheres does come close to overstating the threat, but in the end never seriously detracts from what, even all these years after it was first screened, remains a gripping and genuinely chilling slice of supernatural storytelling. Both films were shot on 16mm film and are framed in their original aspect ratio of 1.33:1. The Stalls of Barchester was transferred in standard definition from the best available film materials and varies a little in quality. Some of the scenes, particularly those in Dr. Black's timeline, have what I can best describe as an aged 16mm look – the image is a few notches short of crisp, the colour palette is earthy (almost reflecting the leather bindings of the books that Black is cataloguing) and the contrast is on the soft side, with black levels more of a gloomy brown at times. But elsewhere the picture is altogether more impressive, with crisper detail and punchier contrast, and outside in the daylight there is even the odd bit of blue sky to keep the browns company. Dust spots are rare, and the image itself is consistently stable. A Warning to the Curious has been mastered in high definition from film elements held in the BBC archive. The image here feels slightly sharper than its companion and the contrast is stronger, with black levels well pitched, particularly important (and effective) in the scenes set in the dark of night. Facial close-ups look particularly good here, and the colour palette is livelier and naturalistic, despite a still present earthy hue to some sequences. There is, however, more visible dirt and dust than on the Barchester transfer. The Dolby 2.0 mono soundtracks are clear and free of damage and display a quite reasonable dynamic range, although – perhaps surprisingly given that it is the older film – The Stalls of Barchester fares somewhat better here. The Barchester (actually Norwich) choir sounds particularly good. As with the previous volume, every one of the extra features here contain spoilers for newcomers to the films they accompany, and should not be watched (or read) beforehand. The first two even come with up-front spoiler warnings. The supremely affable Clark, who directed seven of the BBC's Ghost Story for Christmas films, including the two here, talks about how The Stalls of Barchester allowed him to make the move from documentary to drama, his love of the writings of M.R. James, selecting his main location, casting Robert Hardy (also an M.R. James fan), and the importance of being able to frighten your audience. The option to play this introduction comes when you select the film. Here Clark discusses finding the right locations, the advantages of being a writer-producer-director, the influence of Hitchcock and silent cinema, playing with light and landscape, getting the right actors, and the alterations made to the original story. Again this introduction can accessed by playing the film. In two programmes from the BBC's 4-episode series from 2000, Christopher Lee plays M.R. James in his role of provost of King's College Cambridge at the dawn of the last Century, and relates two of his ghost stories to a small gathering of masters and students as they sit sipping sherry around a coal fire on Christmas Eve. Gold-tinted visuals of James and his attentive, over-privileged audience are intermittently peppered with stylised imagery from the tales themselves. None of which is a problem when you have a storyteller as compelling as Christopher Lee, one of the all-time great baritone voices of cinema. A constant joy to listen to, Lee is also worth watching for his sometimes expressive delivery. Even the sinister notes of music do not detract from these very fine readings. An excellent accompanying booklet that includes: a detailed piece on director Lawrence Gordon Clark and The Stalls of Barchester by Jonathan Rigby (who's a little bit sniffy about Jonathan Miller's Whistle and I'll Come to You); a similarly well written analysis of A Warning to the Curious by Adam Easterbrook; an article on M.R. James and the two stories adapted here by Robert Lloyd Parry; a concise biography of M.R. 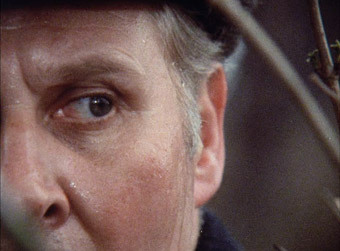 James by Reggie Oliver; a considerably longer one of Lawrence Gordon Clark by Simon Farquhar; biographical pieces on actors Robert Hardy, Clive Swift and Peter Vaughan by Frances Donaldson, Lisa Kerrigan and Kathleen Luckly; surprisingly detailed coverage of both of the episodes of Ghost Stories for Christmas with Christopher Lee; credits for both films and production stills. Masters of Cinema would do well to start looking over their shoulder here. Despite some back story expansion on writer-director Clark's part, The Stalls of Barchester is possibly the most faithful to the original text of the Ghost Stories for Christmas adaptations, while A Warning to the Curious is one of the very best. A splendid double-bill, then, accompanied by a package of quality extra features. Once again, very definitely recommended.